John Howard at The Addison Road Centre! John Howard is currently at The Addison Road Community Centre! 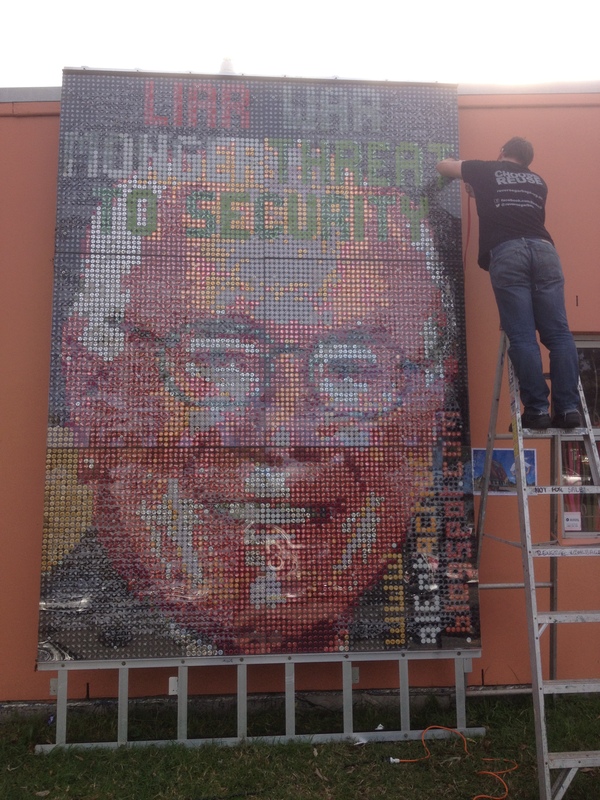 Donated to Reverse Garbage by Australian artist Stan Ghys, the 2.4m x 4m high image of ex-Australian Prime Minister John Howard is made from 10,000 reused beer bottle-tops and travelled Australia in the late 2000’s in protest against, amongst many things, the then Prime Minister’s ‘children overboard’ debacle and the war on Iraq. The art installation is currently secured to the Gumbramorra Hall within The Addison Road Community Centre. Thank you to Stan for choosing reuse and donating the art installation to Reverse Garbage. I’m Dreaming of a Reuse Christmas … Reuse Christmas Setting! Previous Previous post: Get your 2 for 1 Pass to see Satellite Boy!